You would not believe how such a simple change could make such a big difference. Well, you probably would, but that seemed like a good opener. The backstory: we are working on getting the last little things done in the guest room. 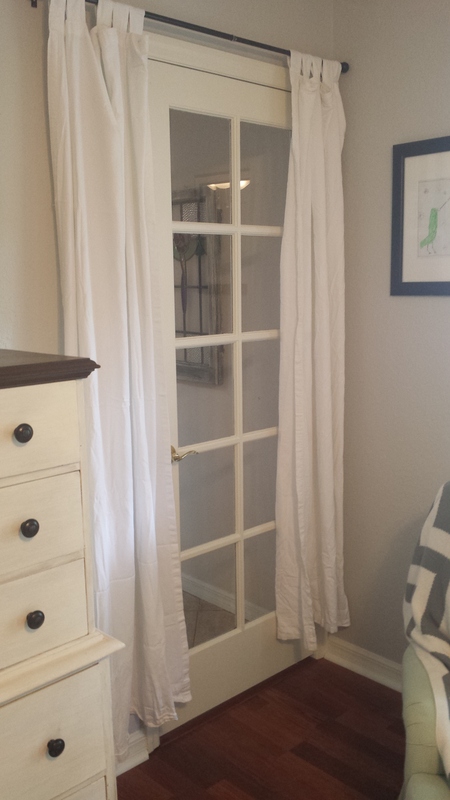 There is a French door leading to the foyer, I suppose so the room could be used as an office or sitting room. We aren’t replacing doors in the house just yet, so we are stuck with glass door, despite using the room as a spare bedroom. Oh no. Oh, no, no, no – this will not do. These curtains used here make me think of ill-fitting clothes (imagine: high-waters) and outdated accessories (think: poufy hair scrunchies. Oh, to think we actually sewed and proudly wore them as teens – in every color possible!) It’s not that the curtains themselves were a problem. It’s that I had to hang them high enough for the door to clear. And that they need to slide open and closed easily (which I don’t find tabs to do). I kindly thanked Ken, and knew I had to fix it somehow. My head hit the pillow that night, and then it came to me: ruffles!! See, Ken’s mom hadn’t just given us just one pair – she gave us about 5 pairs! Of the same type! 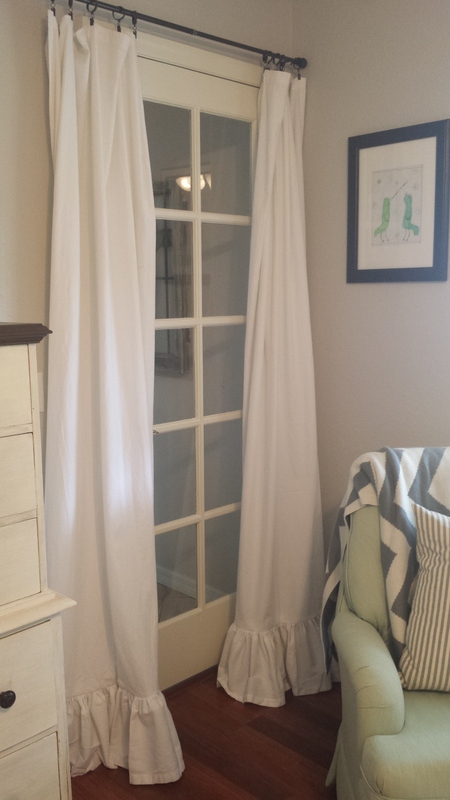 So, a day or two later, I hauled out the sewing machine and gave those nerdy-looking curtains over the door a much-needed makeover. Using another panel, I added some ruffles, dug out some clip rings for easier sliding and then ironed them all. Ta-da!! Now I can warmly welcome guests into our home and show them to their “quarters” without feeling the need to explain that we’re trying to save money and use what we have and that’s why we hung the curtains over the door that we haven’t budgeted to replace yet because the room was supposed to be an office but we’re using it as a guest room and with that in mind won’t you please enjoy your stay! Nope. I can just skip right to the “enjoy your stay” part! P.S. Stay tuned — hope to post more shots of the guest room soon. You future “guests” may be interested in those! Please pardon the poor quality photos. I’m lazy and just snap shots with my phone. Another “someday” . . . I’ll take photos with a nicer camera.